M1819 Hall Flintlock Rifle; photo by Antique Military Rifles on Wikipedia (use permitted with attribution / share alike). WV Metro News; "The firearm was produced at the National Armory in Harper’s Ferry by John H. Hall. It was adopted for use by the US Army in 1819 and was one of the standard firearms for US Army infantry all the way through the Civil War." 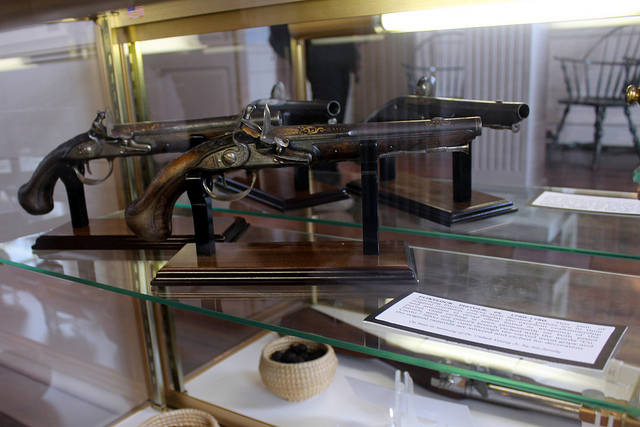 Flintlock pistols; photo by Wally Gobetz on Flickr (noncommercial use permitted with attribution / no derivative works).